Penn alum sinks his acting fangs into "True Blood"
Not since we saw this "classy pimp", have we seen a Penn alum in front of the camera on any of HBO's hottest shows. Now let's add one more to this "Penn alumni on HBO" list. 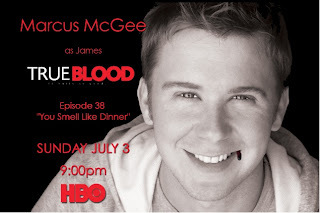 If you saw the first episode of "True Blood" this past week, and then had to go to your HBO GO app to watch the second episode ("You Smell Like Dinner"), you would have seen Penn alum Marcus McGee (C'01) make a cameo as "James". After the jump, check out where in the episode he appeared (plus a screen grab of his appearance!) and find out about Marcus' day on the "True Blood" set! 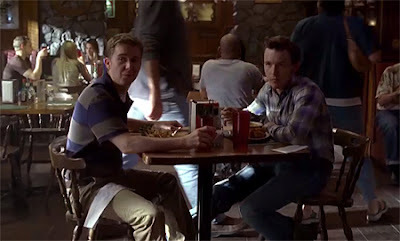 In the episode, Marcus is seen in Merlottes restaurant alongside "Tommy" (the one who plays Sam's shapeshifting younger brother). "The set of Merlottes, where I shot, is on THE LOT on Formosa, but I know they shoot elsewhere. I spent most of the day that I was shooting with Marshall Allman who plays TOMMY on the show and got to work with Sam Trammel who play's his older brother SAM on the show. Both were excellent to work with, and the entire cast and crew made me feel like part of the TRUE BLOOD family, which is exactly what their set is." While this is the only episode he'll be appearing in this season, Marcus tells me that "the door is open" for more of his character on the show. That said, visit HBO's online site to comment on Marcus' character and get him back on the show! And by the way, if you didn't watch the second episode yet on the HBO app, you'll be able to see it on air this Sunday, July 3.